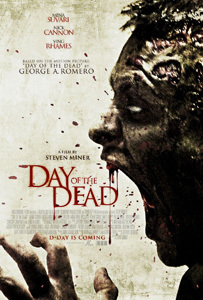 Day of the Dead is a straight to DVD zombie horror about a small Colorado town which is overrun with zombies. As usual a small band of survivors fight to stay alive in the face of a relentless zombie horde and struggle to understand how the outbreak started. This is completely unlike the original Romero film and it would likely receive a better reception if it was released under a different name. Despite boasting a decent cast the writing is unimaginative and the initially stylish fast cut direction becomes repetitive and irritating as the film progresses. The zombies don't behave like zombies should either and the CG blood splatter is a little too obvious. If you view this as a new low budget zombie flick then there's some entertainment to be had but not a lot.